Created and compiled by Charles Krauthammer before his death, The Point of It All is an intimate collection of the influential columnist's most important works. Spanning the personal, political and philosophical - including never-before-published speeches and a major new essay about the effect of today's populist movements on the future of global democracy - this is the most profound book yet by the legendary writer and thinker. Winner of the Pulitzer Prize and named by The Financial Times as the most influential commentator in America, Charles Krauthammer has been honored from every part of the political spectrum for his bold, lucid and original writing -- from the famously liberal People for the American Way (which presented him their First Amendment Award) to the staunchly conservative Bradley Foundation (which awarded him their first $250,000 Bradley Prize) . For three decades, his influential writings have helped frame the very shape of American foreign policy. He coined and developed The Reagan Doctrine (Time, April 1985) , defined the structure of the post-Cold War world in The Unipolar Moment (Foreign Affairs, Winter 1990/1991) , and outlined the principles of post-9/11 American foreign policy in his much-debated Irving Kristol Lecture, Democratic Realism (AEI Press, March 2004) . MSNBC's Joe Scarborough calls him "without a doubt, the most powerful force in American conservatism." National Review featured him on its cover as "Obama's critic-in-chief." Der Spiegel calls him "the leading voice of America's conservative intellectuals." New York Times columnist David Brooks says that today "he's the most important conservative columnist." Politico calls him "leader of the opposition ... a coherent, sophisticated and implacable critic of the new president." 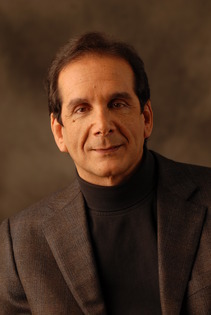 Born in New York City and raised in Montreal, Krauthammer was educated at McGill University (B.A. 1970) , Oxford University (Commonwealth Scholar in Politics) and Harvard (M.D. 1975) . While serving as a resident and then chief resident in psychiatry at Massachusetts General Hospital, he published scientific papers, including the discovery of a form of bipolar disease, that continue to be cited in the psychiatric literature.